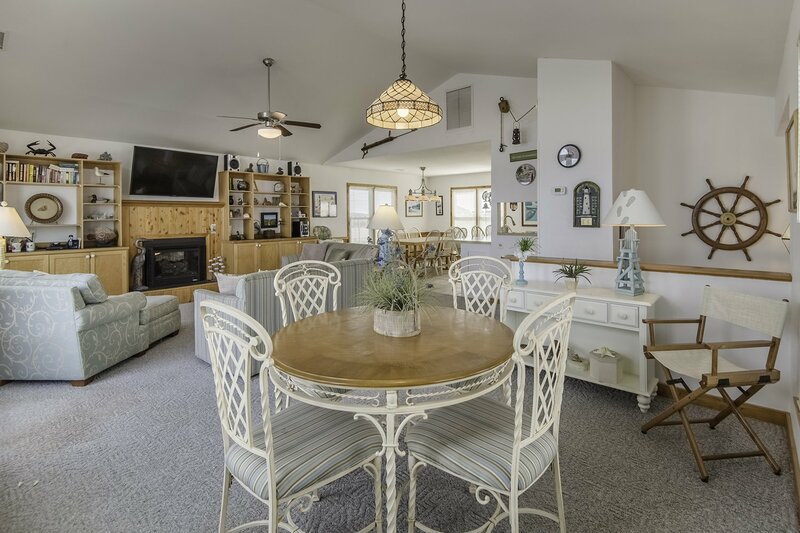 Outstanding views of the Ocean & Beach await when you choose this lovely Kill Devil Hills Oceanfront home for your Outer Banks vacation. Nicely decorated, professionally landscaped & very well equipped, this home offers comfortable furnishings & many thoughtful touches to ensure a relaxing time. There are 5 flat screen TV's (all bedrooms equipped w/TV's) so getting away for some quiet relaxation is possible. Your family is sure to enjoy the wide, spacious beach, & views of the Atlantic & the Wright Brothers National Monument. Take a stroll down the Beach or enjoy the Ocean Breeze from your sun deck, this home is a great place to relax & enjoy the Outer Banks! Ground Level: Parking for 3 Cars, Steps to Mid Level Entry, Laundry Area, Charcoal Grill, Enclosed Outside Shower, & Shared Walkway to Beach (There is a 5 foot wide pedestrian access easement located along the northern property line of this home & a shared walkway that provides beach access for this home & the Driftin' Sands Motel located directly across the street). Mid Level: 4 Bedrooms (1 w/King & Flat Screen TV, 1 w/Queen & Flat Screen TV, Shared Full Bath, 2 w/2 Singles & Flat Screen TV's, & Shared Full Bath), & Covered Deck w/Furniture. Top Level: Living/Dining/Kitchen Area, TV, DVD, Gas Fireplace, Game Table, Half Bath, & Sun Deck w/Furniture. Features include: CA/C & Heat, Washer/Dryer, Dishwasher, Microwave, Phone, 5 Ceiling Mounted TVs, 2 DVDs, Stereo System, Wireless Internet, Ceiling Fans in Each Room, & Baby Equipment (High Chair). No Pets. This is a Non-Smoking Unit. As commented in guest book was a very nice well done house we enjoyed it very much. Great place! It had everything we needed! The new tv was awesome! The size and new position made it so much easier for everyone in our party to see. Thanks! We LOVED the home, esp the ocean views; prob the best house we have rented in this area. We just can't travel up/down so many steps. Just two of us and we are not as young as we used to be! Loved the benches and table on the deck. The tv was exceptional too. Everything was top notch. We had such a fun and relaxing week. Your home is so welcoming. We loved your decor. So many fun things to look at. Thank you for the use of your beautiful home. We hope to come back soon! The decor kept everyone in the beach frame of mind. The game table was a great place for Trouble and Monopoly and I am sure other games, too. Kitchen well equipped. Beds were comfortable.Thanks for the memories for my grandchildren, their parents and me. We loved your house! It was very clean, well taken care of and seemed to have everything we would need. The kitchen is fully stocked and that was so nice. We enjoyed our stay and would not hesitate to go back to the Blue Light Special if we head back to KDH in the future. Overall, we liked the place. The deck furniture on the upper deck was comfortable and newer. The kitchen was well stocked with utensils and pots/pans. That has not always been our experience at other places. Nice place overall. Very comfortable home; will rent again. We love the blue light special !! It is decorated just beautiful and will stay there hopefully a long time !! This home is in an ideal location with amazing views of the beach and ocean. It has a fully stocked kitchen. Best stocked house we have ever stayed, and I have been going to the Outer Banks for over 50 years. GREAT beach location. Half way between public beach accesses, with very few houses across the beach road. If you go to the beach to sit on the beach and enjoy a great deck at night - this is a perfect house. A real nice home to vacation in. It has everything you need. Close to beach and shopping. My family loved it so much they want to come back. This is a great family vacation home. It has wonderful views and is in a great central location. The home is very clean and well equipped with anything we needed. We loved it and won't need to search for any other place to stay in the future, this one is perfect for us! This house is well maintained with beautiful views and in a super location. 2014 was our third time in Blue Light. It has a great beach location. The house itself is the right size for one big family or two small ones. The owners seem to really care about the place so everything is in good working order, kitchen is fully stocked to cook big meals and lots seating on deck and living room. Not the flashiest place but very comfortable and hassle-free. We have signed up for 2015 and will not even be looking for other places.